Sky Rink has been teaching New Yorkers how to skate since 1969. Sky Rink Skating School instructs skaters of all ages and levels in both figure skating and hockey using a progressive, group-based format. Recreational group skating lessons are available for skaters aged 3 and up. Lessons are taught by our professional staff, which includes former national and international champions as well as Olympic competitors. Skating School follows the Learn to Skate USA curriculum, which maintains that skills learned at each level build on the preceding ones. Classes are divided by age groups, including tots (3-5), children (6-17) and adult (18+). 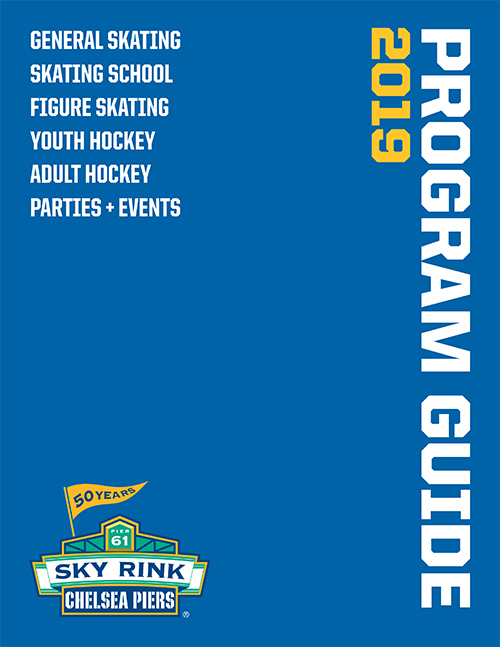 Sky Rink Skating School is committed to building skills and confidence for all of our skaters. Recreational skating group lessons for students age 3 through adult. Introduces basic hockey skills to children ages 4 - 7. Monday night classes for adult skaters who want to advance their skating skills. Prepares beginner / intermediate players for our Game Time Instructional program. For skaters ages 6 - 13 looking to continue beyond the Learn to Skate program. Skaters, ages 3 – 12, build and refine their skills at summer and holiday break camps. A Summer series for adult skaters who want to advance their skating skills. A great way to stay active and beat the heat with on-ice and off-ice classes.